With so many brands and types to choose from, you could be literally spoiled for choice when it comes to selecting the right SSD for your new PC. Ultimately, most consumers will want a SSD that maximizes performance while costing the least amount of money. That is, a product that is cost effective. Transcend targets the mass market with their SSD230S SSD. This is their first SSD to utilize the 3D NAND technology. While 3D NAND does bring better performance and an increase in storage density, it does have a lower endurance level. Therefore, there is a need to adopt special techniques and technologies to improve the durability of the product. In this article, we will take a look at the specifications of the Transcend SSD230S, and find out how this SSD can work around its technological limitations to provide performance and reliability. The SSD230S comes in a 2.5inch form factor, and connects to the motherboard via the standard SATA 6Gbps interface. Therefore, we do not expect the performance of the drive to be comparable to those of a NVMe drive, as it could be most likely to be bottlenecked by the storage interface. The SSD230S is available in 128GB, 256GB, 512GB and 1TB. By opening up the enclosure of the SSD230S, we spotted a PCB that doesn’t even take up the full space of the enclosure. This is possible with the high density 3D NAND flash technology. It is also no wonder that the SSD weighs that light, making ultra-portable notebooks computers possible. There are 4 3D TLC NAND flash memory chip from Micron that’s spotted on the SSD. This also means that each NAND memory chip holds up 32GB (or possibly more) of storage space. The sample that we had is a 128GB model. On the opposite side of the PCB holds the Silicon Motion SM2258 SSD controller, as well as a DDR3 DRAM that is used as a cache. Earlier, we did mention about the endurance limitations of 3D NAND flash. Silicon Motion’s SM2258 SSD uniquely mitigates this problem with their NANDXtend ECC technology. This technology uses a low-density parity check (LDPC), which confirms the accuracy of transmitted data before writing to the memory chip. This prevents unnecessary writes to the drive which compromises the integrity of the floating gates in a flash memory chip. We shan’t go into the technical details, but essentially, the more write operations to a drive, the more likely it is for the drive to fail. NANDXtend can effectively reduce the number of write cycles to the drive by reducing redundant write operations. SMI also used StaticDataRefresh technology make sure that each charge in the cell (which stores the actual bit) remains at the voltage level that it should be. The worst case that could happen to a cell, is that the data of 0 stored becomes a 1 due to the interference of neighboring cells. This will then affect the overall read performance of the drive. This technology refreshes each cell and correct the voltages to allow the drive to sustain a higher read performance overtime. The DDR3 memory chip on the Transcend SSD230S acts as an interface between the fast main memory and slower NAND storage flash. This allows frequently used data to be stored directly on the DDR3 memory chip, thus allowing quick access of the data to be transferred over to the main memory. Such an architecture allows the SSD to perform better in certain usage scenarios. Transcend has included their SSD Scope software which allows users to benchmark the SSD230S. Of course, we should not trust the performance benchmark that comes with the manufacturer, as it is sure to be skewed towards showing the high performance of its drive. We shall run CrystalDiskMark, ATTO Disk Benchmark and try out Windows file transfer scenarios to find out the actual performance of this drive later in the benchmark section of the article. It was also noted that the SSD Scope also has a Status function, which shows SSD’s wear-out indicator. Transcend warranty states that “Warranty does not apply when SSD Scope’s wear-out indicator displays 0% within the warranty coverage”. This shows that they are voiding the warranty for users who will have excessive write operations to the SSD drive, which will degrade the drive. However, we also know that day-to-day usage of a usual SSD will not affect the endurance too much, and thus such an indication is only used for preventing the misuse of the products for other purposes. After more than a month of usage on the Transcend SSD230S, our current wear out indicator shows 99%. Therefore, you should be fully covered within the 3-year warranty period of the Transcend SSD230S. All benchmarks were ran with an Intel Core i3 6100 Processor on a ASUS B150 Pro Gaming D3 motherboard. The sequential read of a 1GB file yields a speed of 564MB/s. This is considered to be rather impressive, as most SATA drives tend to only reach between the range of 530 to 550+ MB/s. It is the first time we see the raw performance of a SSD drive which targets the budget conscious consumers to attain a read speed of over 560MB/s. Its sequential write is also considerably high at 493.9MB/s. However, we did take note that it is slightly off from the rated 500MB/s. When it comes to random access of small sized files, the IOPs (input output operations per second) rating of a SSD drive is the metric to look at. The Transcend SSD230S comes with a 85,000 IOPs rating. The CrystalDiskMark benchmark can test the performance of the SSD in such a random access manner with different transfer methods (Q- queue size, T-number of threads working on the transfer). The random read and write of small 4KB sizes in both Q8T8 and Q32T1 tests returned similar results. This means that the generally, the random read write operations of a PC will get this kind of performance. In a single threaded read/write operation with a queue size of 1, the real performance of the NAND chips and storage controller are tested (because all data are directly written/read directly without any buffering). The benchmark returned a result of 35.59MB/s for read, and 124.1MB/s for write. Just solely based on CrystalDiskMark, we can see that the Transcend SSD230S seems to perform considerably well, when compared to other SSDs at the same price range based on our previous experiences. ATTO Disk Benchmark returned similar results as CrystalDiskMark. It seems that the drive fails to reach its rated write speed on 500MB/s. The highest speed it attained was only 495.95MB/s. We then tested the Transcend SSD230S in a Windows File Transfer operation. There were two types of scenarios for the test. Firstly, we transferred a single large file. Secondly, we took a bunch of random files of varying sizes instead. The 20GB large file transferred to the drive at about 437MB/s (this is the point where the graph showed a constant write speed to the drive). On the second test with multiple files of varying sizes are written to the drive, the write speed was shown to be at 194MB/s. We can expect this kind of performance for most day-to-day operations on the drive. The Transcend SSD230S Solid State Drive performed well in our tests, and was able to sustain speeds that are much higher than most budget-oriented SSDs in the market. However, we were somewhat disappointed by the fact that the SSD was not able to get its expected 500MB/s write speed which it promised from its specification sheets. Nonetheless, it’s still a superb product that has been shown to be worth every single dollar that it costs! With such a great value and performance, the Transcend SSD230S SSD will be awarded with The Tech Revolutionist’s Value Award for the month of June 2018. The Transcend SSD230S SSD is currently available via the Transcend Official Store on Lazada. The 128GB version, which is featured is this review is currently priced only at S$68! Other capacities are also available. These products are distributed by Convergent Singapore, who will cover all after sales and warranty services for Transcend products. 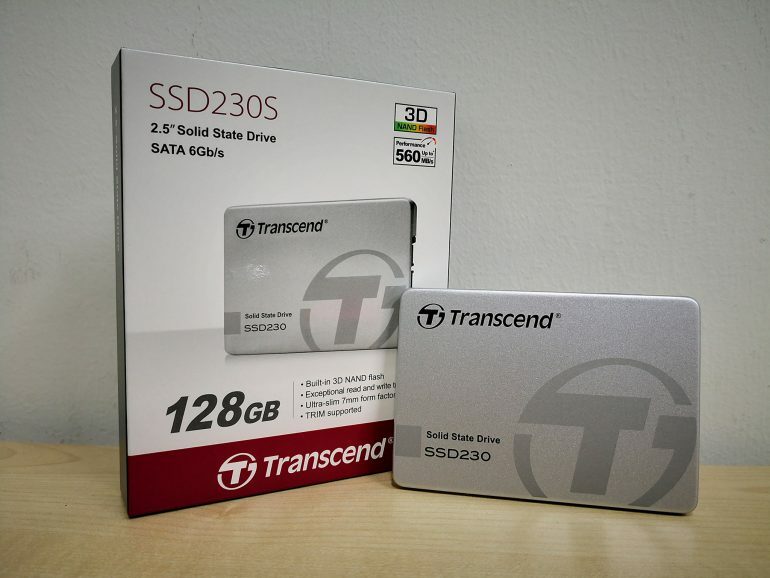 All Transcend SSD230S SSD will come with 3 years of limited manufacturer warranty.